It's nice that Deron has finally been chosen to the All-Star game. He's undoubtedly one of the top 3 point guards in the West and has been for years. But, perhaps more intriguingly, Deron could be a starter for his first all-star appearance. While Steve Nash was voted the starting point guard by the fans, the starting shooting guard, Kobe, hasn't played the last few games due to injury. If Kobe can't play, who would replace him? Well, a quick look at the backup guards in the West looks like a daily injury report. Brandon Roy has been dealing with injuries all year and has been replaced by the WWF's own Chris Kaman. Chris Paul is scheduled to have knee surgery and has been replaced by Chauncey Billups, who himself is hurt. 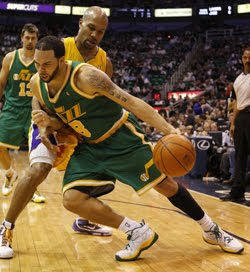 (He missed the recent game against the Jazz with sprains in both ankles). So, it looks like Deron is the only guard standing. If Kobe can't go (and he didn't play last night), Deron could be in line for heavy minutes as the starting shooting guard. And if he's spotting up and taking dimes from Nash, he might make a run at MVP. How would that be for a debut? I think I counted 9 "if's" in that post.